So the nice suits at HMRC are offering a £2,000 ‘Employment Allowance’ for their Employers’ National Insurance for most businesses in the UK from 6th April and we’ve made it easy to manage in Sage One Payroll. So what exactly is the Employment Allowance? 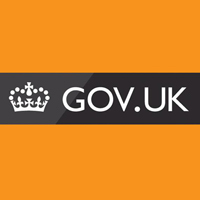 My previous blog “Government offers £2,000 ‘Employment Allowance’ for National Insurance” explains a bit more detail about what it is….but in simple terms it allows employers and charities to claim back (i.e. reduce) up to £2,000 per tax year from their employers Class 1 National Insurance (NIC). The government expects up to 1.25 million employers to benefit, with over 90% of the benefit going to small businesses. Will Sage One Payroll help me take advantage of this new allowance? Absolutely! 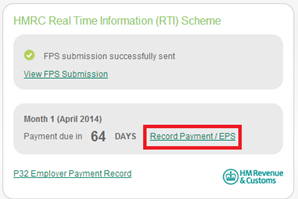 The good news is that we’ve made this really simple by seamlessly integrating it into your normal monthly (or quarterly) HMRC payment process when submitting an Employers Payment Summary (EPS) and printing your P32 Employer Record report. So how do I inform HMRC that I’m taking advantage of this new allowance? Let’s say you’ve started your new 2014/15 tax year by processing then submitting your Full Payment Submissions for tax weeks 1 to 4 successfully to HMRC. As a result of this HMRC are in a position that they already know how much you owe them in outstanding tax and NIC liability…it’s now up to you to advise HMRC that you want to take advantage of the new allowance as part of your EPS submission. 1. You record your P32 payment in exactly the same way you have previously by clicking the Record Payment/EPS link. 2. 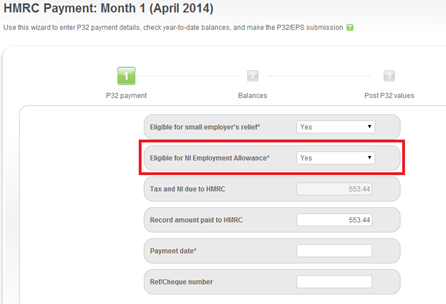 From the HMRC Payment Wizard, on Step 1 we’ve added the option to choose whether you are ‘Eligible for NI Employment Allowance’. All you need to do is to select the drop down arrow and choose ‘yes’. Sage One Payroll will then automatically calculate how much you can reduce your employers NIC liability. Where can I see how the allowance impacts what I need to pay HMRC? 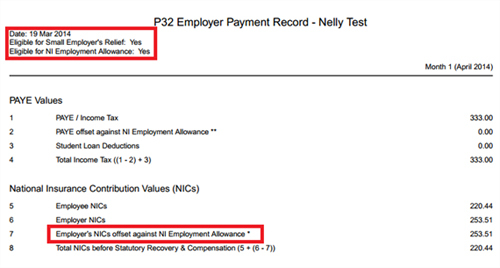 We’ve update the P32 Employer Payment record report so that you will now be able to track how much Employers NIC has been offset against NI Employment Allowance in the relevant tax month/quarter. In the bottom section of the same P32 report you can keep also track of how much of the Employment Allowance remains. Get Sage One Payroll now! If you’re looking for a quick, easy and low-cost way to manage your payroll and have 15 employees or fewer, Sage One Payroll is perfect for your business. Presumably if one only makes payments quarterly, then you leave well alone until the end of the first quarter, at which point you do the EPS and make the notification? I was thinking exactly the same thing, so await the response with anticipation! Thanks for your question. If you process your P32 payment to HMRC quarterly then yes you are quite correct, you would leave this until you are ready to run through the P32/EPS Process for your relevant quarterly payment. What if I missed notifying for Month 1, can I just start from Mth 2 (Instant Payroll)? HI – so where does the final figure show that I need to make payment of? Where we select ‘yes’ will it notify me if I have reached the £2000 limit? Below youll locate the link to some web pages that we think it is best to visit. The info talked about in the report are some of the very best accessible. Please stop by the web pages we adhere to, including this one, as it represents our picks through the web.